Research background: The commitment to increasing the volume of agricultural production remains the main strategy for food supply in Ukraine. In fact, such an approach does not solve the problem of the limitation of food’s physical availability. It works quite the opposite way, as there is a guaranteed food loss and waste, worsened environmental situation and decreased level of economic availability of food. Purpose of the article: According to the results of the empirical study, the volume of food shortages has been determined as a result of food loss and waste, food surpluses in case of compliance with the rational consumption norms and zero food loss and waste, as well as potential social benefits from reducing food loss and waste. Methods: The research of the limitation of the physical availability of the different types of products as a result of food loss and waste was carried out according to the methodology developed by the authors. In particular, for the group of products in which the consumption deficit is established in a small number of regions — the main indicator is the "production surplus in the conditions when the rational consumption norms and zero food loss are met"; for the group of products in which the consumption deficit is established in the vast majority of regions — the main calculation indicators are the "production shortage in the conditions when the rational consumption norms and zero food loss are met" and the "specific gravity of the consumption shortage, which occurs as a result of food loss and waste". Findings & Value added: The obtained results are crucially important for shaping of the food security policy. Reducing of the food loss and waste has positive social consequences through the expansion of the physical availability of food, which, under other conditions, leads to greater economic availability of products, as well as contributes to the gender equality and poverty reduction for rural residents. Babych, M., & Kovalenko, A. (2018). Food security indicators in Ukraine: current state and trends of development. 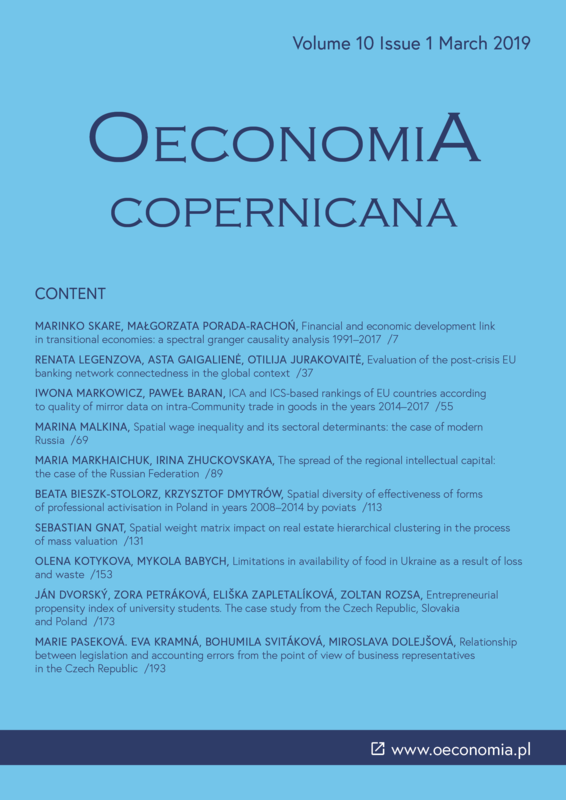 Baltic Journal of Economic Studies, 4(1). doi: 10.30525/2256-0742/2018-4-1-8-15. Babych, М. (2018). Losses of food and food waste on the basis of creating their value. In Economics, marketing and law: theoretical approaches and practical aspects of development. Dordrecht: Center for Financial and Economic Research. Chegere, M. J. (2018). Post-harvest losses reduction by small-scale maize farmers: the role of handling practices. Food Policy, 77. doi: 10.1016/j.foodpol. 2018.05.001. FAO (2011). Global food losses and food waste – extent, causes and prevention. Rome. Retrieved from http://www.fao.org/docrep/014/mb060e/mb060e00.pdf (10.09.2018). FAO (2013). Food wastage footprint: impacts on natural resources. Rome. Retrieved from http://www.fao.org/docrep/018/i3347e/i3347e.pdf (10.09.2018). Hanson, C., & Mitchell, P. (2017). The business case for reducing food loss and Waste. Retrieved from http://www.wrap.org.uk/sites/files/wrap/Report_The% 20Business%20Case%20for%20Reducing%20Food%20Loss%20and%20Waste.pdf (15.04.2018). Kotykova, O. (2010). Grounding and realization of land resources management principles as a way to maintain stable development of land tenure. Actual Problems of Economics, 1. Lipinski, B., Hanson, C., Lomax, J., Kitinoja, L., & Searchinger, T. (2013). Reducing food loss and waste. Working Paper, Installment 2 of Creating a Sustainable Food Future. Retrieved from http://www.worldresourc esreport.org (15.04.2018). Mylona, K., Maragkoudakis, P., Miko, L., Bock, A.-K., Wollgast, J., Caldeira, S., & Ulberth, F. (2017). Future of food safety and nutrition – Seeking win-wins, coping with trade-offs. Food Policy, 74. doi: org/10.1016/j.foodpol. 2017.12.002. Save Food (2015). Global initiative on food loss and waste reduction food and agriculture organization of the United Nations. Rome. Retrieved from http://www.fao.org/3/a-i4068e.pdf25.02.2018 (15.04.2018). Schuster, M., & Torero, M. (2016). Toward a sustainable food system: reducing food loss and waste. In 2016 Global Food Policy Report. Retrieved from http://ebrary.ifpri.org/utils/getfile/collection/p15738coll2/id/130211/filename/130422.pdf (15.04.2018). Sheahan, M., & Barrett, C. (2017). Food loss and waste in Sub-Saharan Africa. Food Policy, 70. doi: org/10.1016/j.foodpol.2017.03.012. Tesfaye, W., & Tirivayi,N. (2018). The impacts of postharvest storage innovations on food security and welfare in Ethiopia. Food Policy, 75. doi: org/10.1016/j.foodpol.2018.01.004. Timothy, J. R., & Stephen, F. (2018). Hamilton. Food waste in the sharing economy. Food Policy, 75. doi: org/10.1016/j.foodpol.2018.01.008. Zezza, A., Carletto, C., Fiedler, J., Gennari, P., & Jolliffe, D. (2017). Food counts. Measuring food consumption and expenditures in household consumption and expenditure surveys (HCES). Introduction to the special issue. Food Policy, 72. doi: org/10.1016/j.foodpol.2017.08.007.